Despite this year being significantly tamer than last year's festival, our South by Southwest was truly eventful, but this year for completely different reasons. Read below for a day-by-day account of what we got up to, our musical highlights, and some snaps to accompany it all. It was unclear if Nicola and I would be reunited in Austin. Her visa is pending and the US government can be less-forgiving at times. Once the text reading "I made it across the border" was received, weights were lifted. We rejoiced over celebratory tex-mex alongside our Austin family. It was good to be back. Friday the 13th. The night we listened to Delta Spirit at Hotel Vegas, drank $4 whiskey (pre-SXSW surges), danced at the White Horse and ended up in a van to a South Austin commune. The evening ended appropriately, with a 3am metal drum jam session. Let the Kinkos camping begin. We assumed our familiar place in the downtown printing shop to turn trees into colorful flyers. The remainder of the day was devoted to east side flyering and venue visits. Grandma's we had become. After a laptop-induced day, we made a bountiful home cooked meal with enough vegetables to confuse our bodies. There was no quest in sight. It got weird. We walked into town to meet our Aussie bud, Larry Heath (the man behind the impressive AU Review). We reunited at The Empire for sets from East Cameron Folkcore and Whiskey Shivers before retiring to taco trucks and Brits. The rest of the night was devoted to the British Embassy for Irish bands and music engineering networking, appropriately over Bulleit. Tuesday was the day when all the normal attendees touched down in Austin. En route to meet our friend Heidi (Paper Garden Records), we ran into our talented friend, Mr. Upperhand Art himself, Brian. The innagural Iron Cactus SXSW welcome lunch was had before fueling ourselves for an evening marathon. After paying our dues at our favorite east side drinking establishment, The Yellow Jacket (and running into Brooklyn friends), we met yet another BK friend, Emmy (who runs DNNM) at Hotel Vegas. 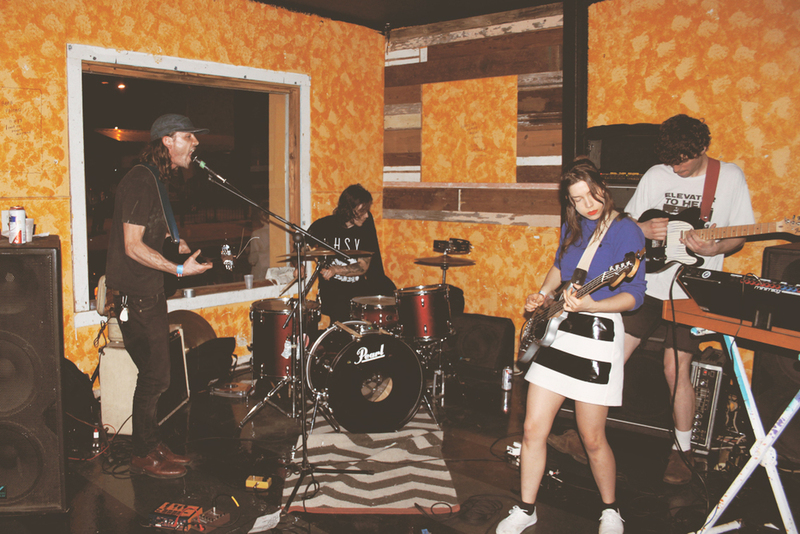 The night took us east, far east, to unchartered territories for a DIY house show. Naturally. Lines. This pretty much summed up Wednesday. After queuing up for Spotify House, we got in just in time to miss the dapper man of the hour, Leon Bridges. Sigh. Luckily, free snacks kept us afloat while catching some afternoon music before heading down the road to Hype Hotel. Canadians, Alvvays put on an impressive performance worthy of remembering. En route to the Fader Fort, for more lines, we ran into SF friends from Polyvinyl before mingling with the cool kids during Chance the Rapper's set. We headed over to St. David's for a quick venue scout, acoustic preview and avant garde performance in Bethell Hall. After backline procurement and caffeine overdoses, we headed over to help Larry with his AU Review interview + sessions. The laborious 'holding of the mic' and occasional 'pressing record' exhausted all of our energy. We decided to extend our services to Sir Steve Smyth. He had a bit of a rough night, so we felt compelled to offer up a different kind of session, a therapy session. Slightly different to what Larry had in mind. The next stop was Cheer Up Charlies for East Side King noms, Free People encounters and Polyvinyl showcase hangs. Our friends at Polyvinyl put on an impressive showcase featuring White Reaper, Jacco Gardner and The Dodos. We sprinted east in time to catch Kevin Garrett seduce the crowd (bouncers included) during our friend's showcase at Stay Gold. Late night food trucks were tasted and bed was near. Friday no longer meant the day before the weekend, rather the day before our showcase. Thus, last-minute errands and logistical tasks encompassed the majority of our day. Breakfast tacos, bloody's, and music by Clear Plastic Masks and Bee Caves started our day at the Front Gate Party. After meeting the organizer of Austin Psych Fest/Levitation, we stopped by the Aussie BBQ in the torrential rain to see Clockwise live up to his name as another completely mad Australian. We then watched youngsters San Cisco before heading east to catch up with our friends at Squarespace at the Paste House and Daytrotter Studio (aka Good Danny's). Approximately 10 New York friends were casually present. Obviously. The next show quite possibly takes the lead for the week's highlight (other than our own). We sat down in the pews of St. David's Church to be treated to performance by some of our favorite musicians, Laura Marling and Leon Bridges. Bridges was backed by members of White Denim, the very men who discovered his talents and one of our favorite bands. It was breathtaking and emotional. Saturday, March 21st, 2015. The day we had so famously spoken about for the past couple of months. Apologies friends and family. Backline finalizing, cacti nursery runs, Kinkos camp outs, flyering, final advancements, caffeine injections and projection visuals were just the start of our day. The evening saw our first 'Official SXSW Showcase' at St. David's Bethell Hall; a dream we made into a reality. (Inspirational quotes welcomed). We had the pleasure of producing a show in a church, where the acoustics were a focal point and the atmosphere was central to the performances. We showcased the music of artists who we've been personally invested in. Watching Bob Boilen of NPR sit front and center was a monumental moment for us as curators. The audience was engaged with the music, something that. This showcase allowed us to support emerging musicians we're passionate about, expose their talents to new audiences and highlight their sound in a space that's core to the auditory experience. This is the very reason we started Willow Wood. Currently, it is approximately 6pm, 70 degrees and we're sitting on a veranda overlooking South Congress. This information would give you reason to believe that we have extended are stay, and indeed, still in Austin. That is correct. When we're not glued to our laptop screens, we're eating queso, swimming in Barton Springs and guzzling all of the cold brew bearded hipsters with man buns have to offer. California, see you soon.